Don’t you hate it when you’re about to drive outside and it starts pouring? Driving in the rain can be quite dangerous, so follow these tips the next time you’re caught in the rain. Keep your eyes on the road and pay attention to the cars around you. Be on the lookout for pedestrians or motorcyclists that may be hard to see in the rain. Keep your headlights on so that vehicles can see you and you can see them! It’ll be darker while it’s raining so make sure that you’re visible and alert to what’s happening around you. Try to keep your car away from large puddles of water as this can damage your car’s electrical systems. The last thing you want is to be stranded outside in the rain with a damaged car! Hydroplaning (skidding) is where the tyres lose their grip on a wet surface and slides. The most dangerous time is within the first 10 minutes of light rain. Try to drive in the tracks of the cars in front of you to increase your tyre grip on the road. Allow a 5 second gap between you and the car in front. This will give you more time to react to unexpected traffic conditions such as cars hydroplaning or merging traffic. By doing this, you can avoid any nasty crashes. This can lead to a loss of control and hydroplaning. Remember to slowly apply pressure to the brakes to give you a better handle on the vehicle. Keep an eye out for tree branches or anything that can cause damage to your car. You may see a potentially damaging object so try to avoid sharp turns as oversteering can cause you to lose control of your car. 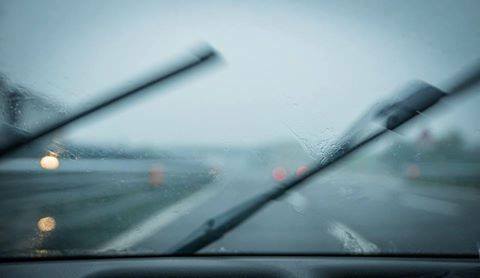 The rain can cause your windscreen to fog up, blocking your vision. Turn on the defogger and aircon in the front and back of your car. You’ll get the best results running the aircon on cold! Check live traffic updates online or on the radio to see if there are any road closures or accidents. Plan your trip to avoid heavy traffic and be aware of current weather conditions. There may be slow-moving traffic or car accidents along the way, so be prepared to spend a little more time out on the rainy road. Main Point: Remember to adjust your driving based on the conditions you’re in. Share these tips with your friends to help us all drive safer in the rain!